How much should I wear my new hearing aids? First of all, wearing your new hearing aids just a little bit of the time is a bad idea. You'll never get used to hearing with your hearing aids, that way. The occasional hearing aid wearer is the one who complains the most about background noise. To receive the best results from your new hearing aids, learn to wear them most of your waking hours. This way you will gradually "acclimate" to more and better hearing. Using your hearing aids only part of the time often turns into none of the time... and here's why. You began wearing hearing aids because your hearing changed, and you wanted back your ability to communicate effectively. Without hearing aids, many sounds are too soft for you to hear. Wearing hearing aids will bring the soft sounds back into your range of hearing. Better hearing with hearing aids means your brain now has the task of processing much more information. Those "whisper sounds" (f, s, th & k) critical for understanding speech are now being heard along with many other non-speech sounds. Over time, you will adjust to hearing all of the normal sounds... but you will need to give it time! Your brain, using it's working memory, will learn how to tune in and listen to the important sounds while it tunes out the unimportant sounds. In other words, with training you will improve your listening skills and learn to process what's important, while tuning out what's not important. Before wearing hearing aids you didn't need to tune out all of the unimportant soft sounds, simply because... you were not hearing them. From birth through early childhood all of your senses (hearing, vision, smell & touch) became finely tuned to perceive and process the world around you with the highest degree of precision and accuracy. The onset of a change in hearing most often occurs gradually. You slowly become accustomed to a quieter world. But now you are unable to hear the softer sounds of speech (s, f, th and k), and this causes you to misunderstand what's been said. It will take you only a few months, consistently hearing with properly fitted hearing instruments provided by your hearing professional, to achieve your best hearing. If you're not exercising your brain with good hearing on a regular basis, it will perform poorly, especially when trying to hear speech in noise. If you have not fully acclimated to hearing better with hearing instruments you can quickly become annoyed and frustrated. With the help of a qualified and experienced hearing professional, you will learn to tune in and tune out sounds. You will become a good listener again. Better hearing and training your brain to become a good listener will only happen with the consistent use of properly fitted and finely tuned hearing aids. A qualified and experienced hearing specialist will train you to hear more and listen better over a period of time. To obtain the maximum benefit and value from your new set of hearing aids and to become a happy and satisfied hearing aid wearer, make certain you follow up with your hearing aid specialist on a regular basis and wear your hearing instruments daily. Following this simple advice will avoid having your new hearing aids end up in a drawer... and those instruments are always the ones that will cost you the most! How do loud sounds damage my hearing? Be aware of how you are treating your ears. Your decision can have an enormous influence on your quality of life for years to come. We've all heard that listening to loud sounds will damage hearing. Really? What's this "noise" about loud sounds and hearing loss all about? Let's take a look. Hold Your hand before your mouth and count out loud one to five. What did you feel? That air (your breath) is also sound. Sound is picked up by the Outer Ear and directed down th ear canal to the ear drum putting the ear drum (Tympanic Membrane) in motion. As I'm speaking to you, put your opened hand cupped behind your outer ear. The sound is louder, because you are catching more sound waves and directing them down the ear canal to the ear drum which in turn makes the ear drum vibrate stronger. 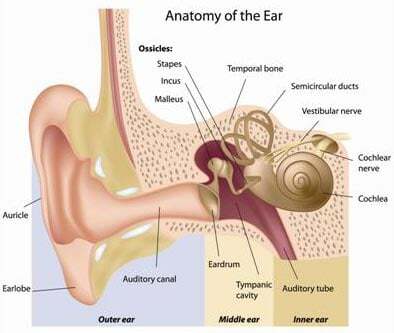 The ear drum separates the Outer Ear from the Middle Ear. The Middle Ear consists of an air filled cavity with a tube that begins in the back of the nose. This tube (Eustachian tube) is normally closed, but when we yawn or swallow, it opens mementarily. Swallow now and hear a soft click in your ears. That click was air rushing into the Middle Ear space and stricking your ear drum from the inside. The ear works best when air pressures on both sides of the ear drum are equal. Within the Middle Ear are three smallest bones in our bodies. The Hammer (malleus), the anvil (incus) and the stirrup (stapes). These three bones (Ossicles), connect the ear drum with the inner. The Hammer is attached to the ear drum on one end and to the anvil on the other. The anvil joins with the stirrup. The foot plate of the stirrup is seated in an opening in the snail shell shaped Inner Ear (Cochlea). The Ossicles are attached to the middle Ear walls by two small muscles. The Cochlea is the organ of hearing. The Cochlea is hollow, is filled with liquid, and contains a shelf extending the full length of the three turns of this snail shell on which 40,000 hair-like hair cells are attached. Sound striking the Ear Drum causes the Ear Drum to vibrate which causes the middle ear bones to vibrate and the foot plate of the stirrup rocks in and out at the opening into the inner ear. This action causes the fluid in the inner ear to move. If I were to tie a rope to a door knob and shake the rope up and down, the rope would form a wave flowing to the door knob. The same wave action occurs in the cochlea as the shelf containing the hair cells moves like the rope, when the foot plate o the stirrup rocks in and ourt at the inner ear opening. As the shelf moves, the hair cells move as seaweed swaying in a wave in the ocean. The drawing (above) of the ear shows the shelf (Basilar Membrane) on which 40,000 hair-like nerve endings are attached. These nerve endings join together and exit the Cochlea as the 8th cranial nerve, the HEARING NERVE that travels to the hearing center of the brain. The shelf also consists of a wall-supporting ceiling that is immediately above the hair cells on the shelf. As the wave moves the shelf up and down, some of the hair cells strike the ceiling which excite an electrical-neural charge that travels to the brain by the hearing nerve, and we hear. While we are talking here, some of the hair cells are striking the ceiling and some are not. Now, clap your hands. More hair cells are striking the ceiling. Snap your fingers and even more hair cells are striking the ceiling. This is how we hear. The Cochlea also contains the organ responsible for our sense of balance; the Semicircular Canals. An explanation of this organ is found toward the end of this paper. The body protects its delicate sense organs from over stimulation. When we walk into a movie theater from the bright sun of the outside, something happens to our eyes. What happens? The pupils of our eyes become larger (dilate) letting more light energy strike our retina (the organ for seeing) so we can see better in the dark and won't be walking into walls while we find our seats. When we leave the darkened movie room, the opposite occurs. The pupil now becomes smaller so that our retina is not damaged from too much light striking it. Our brains sense these changes and automatically make the adjustments. Our ears have a similar protection device. When the brain senses that sound is getting too loud, it causes the two little muscles in the middle ear to cause the ear drum to stiffen, making it a hard reflective surface. This hard reflective eardrum reflects some of the sound away, protecting the hair cells from being over stimulated and being damaged or destroyed. However, it has been only a few thousand years that we have exposed ourselves to long duration damaging loud sounds. The little mid-ear muscles are not capable of protecting the inner ear for extended periods of time. They fatigue very soon, allowing the eardrum protective stiffness to diminish which allows the full sound energy to transfer to the inner ear. Such high energy sound can damage or destroy hair cells. I recently attended a professional baseball game at Coors Field in Denver. A woman with a very high pitched and loud voice sat next to me on my left side. She obviously enjoyed baseball by being very vocal and responded loudly at every opportunity. We were sitting on the left field side with home plate to our right, which meant that, as she watched the action at the plate, she was looking to her right with "her team support" directed to my left ear. So as not to interfere with her style of home team enthusiasm, I carefully tore a corner off a paper napkin from my lunch, pinched it into a makeshift earplug, and inserted it into my left ear canal while she was visiting with friends sitting to her left. I don't think she was aware of my move. The game lasted somewhat short of two hours. After the game, when I reached my car, I removed the protective earplug and was amazed at the difference in my hearing. I had a very noticeable hearing loss in my right ear, the one exposed to a normal afternoon's sound level at a professional baseball game. By the time I arrived home the hearing loss had recovered; hearing in both ears was equal. With the makeshift earplug in my left ear, that ear was protected from the high level sound from my neighbor and a normal afternoon's sounds at a professional baseball game that my right ear was exposed to. Referring back to the previous discussion of the body's protection devices, my right middle ear muscles were called into play to cause the eardrum to become stiff, thus reflecting some of the high energy sound away, and protecting the hair cells in my right cochlea. However, in time, the middle ear muscles became fatigued and their protective action diminished. 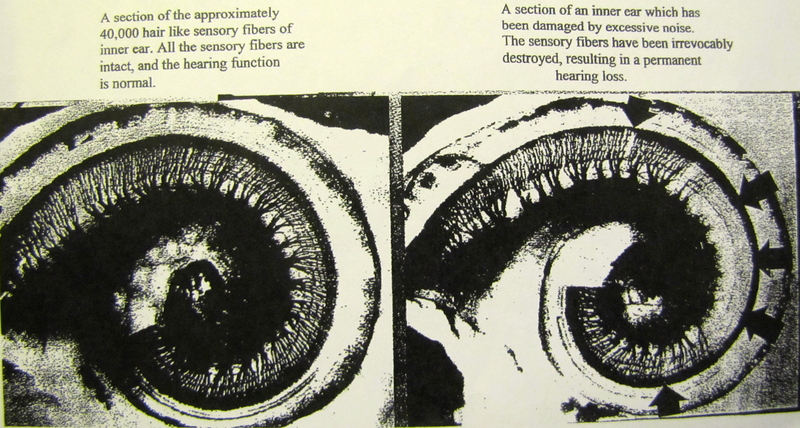 Then my cochlea received the full power of the environmental sound. The hair cells in my right ear became over stimulated resulting in a threshold shift in my hearing level. I had acquired a temporary noise related hearing loss which recovered with time in a quieter environment. A normal young ear can detect very low pitched sounds, (lower than the lowest pitch on a concert organ) and high pitched sounds (higher than a high pitched whistle). The above curve shows that the low tones and very high tones require more intensity (power) to be heard than the middle tones. Our hearing is less sensitive at both ends than at the middle range. Sounds we use for speech are found in this middle (most sensitive) range, known as the Speech Range. Our speech consists of vowel sounds and consonant sounds. The vowel sounds (a,e,i,o,u and combinations ie,ou, etc.) are low pitches sounds in the Speech Range, and are all voiced. They are the carrying powwer of speech. The consonant sounds are high pitched sounds on the upper area of the Speech Range. Consonants are weaker in power than vowels; some of them are voiceless (s, th, f, k and combinations). The consonant sounds are the sounds that give us meaning to our speech, as described in the Johnny, pick up your toys" example below. Extended high noise level exposure damages (or destroys) the hair cells in our cochlea, the area where high frequency consonant sounds are located, permanently affecting speech understanding. Johnny, pick up your toys. `o`nny, `i`i `u` you` `oy`. In this example, the words are loud enough but not clear and the sentence is distorted. So, although Johnny hears, he does not always clearly understand. This is what high noise exposure hearing loss is like. When the brain perceives high noise levels, it reacts. Blood vessels in the brain dilate while blood vessels in other parts constrict. Blood pressure rises, and the heart rhythm changes. The blood cholesterol levels rise. Various endocrine glands puor additional hormones into the blood. The stomach changes its rate of acid secretion. These bodily changes contribute to the Physical High one experiences at amplified rock concerts, enclosed basketball and hockey games, enclosed swimming meets, automobile and horse racing events snowmobile riding, jet skiing, motorized bicycle racing events, and on and on. These physical changes have been measured following common daily activities such as the use of power garden tools, home workshop activity, hunting, exploding fire crackers at close range, at industrial plants, operating large agriculture equipment and even in some cafeteria lunch rooms. If you have experienced ringing in your ears following a high noise exposure event, you ahve been exposed to potential inner injury. We judge our speech loudness level by how we hear ourselves. Being exposed to high noise levels can fatigue the inner ear resulting in, what audiologists refer to as a threshold shift. Meaning on a hearing test, one's hearing is not quite as good as before. One requires an increase in sound above the level heard before; a threshold of hearing shift. After high sound level exposure, friends may observe that you are speaking at a louder level than before. You speak louder since you don't hear yourself as loud as before. Most of these reactions to high sound level exposure are temporary. Hearing threshold levels usually return with time, in a quieter environment. While most of these reactions are only temporary, modern environments present such ever-changing noise levels that some of these "temporary" effects become permanent. Generic earplugs for musicians (ER-20 High Fidelity Earplugs) are available at most hearing aid centers for about $50.00 a pair. These earplugs contain filters that pass most frequencies of the music while reducing the total sound pressure exposure experienced. When cutting grass with loud power lawn equipment and snowblowers, exploding firecrackers, use standard earplugs of muffs which are available at most sorts, hardware and drug stores. Wear simple earplugs. Special ear muffs digitally designed to reduce environmental noise while providing quality signals for music are available from about $75.00 to several hundred. Since high level sound exposure puts one in a stressful state, wearing earplugs or muffs will reduce the "jet lag" experience on long flights. You will be fresher and more relaxed when you reach your destination. Ear protection plugs and muffs especially designed for hunters and gun enthusiasts are available at sporting good stores. Simple plugs are available to attenuate all sounds. Special digital models to allow normal hearing until a sudden loud sound, like a shot, is present when protection is applied. The human ear responds at several specific sound levels. Hearing Threshold (HT). The weakest sound a person can hear. Most Comfortable Level (MCL). This is a range above the hearing threshold we use in conversational speech. Threshold of Discomfort (TD). This is a sound level where sound becomes uncomfortable to listen to. Threshold of Pain (TP). A point at which physical pain is experienced. We have all been in our cars when we are suddenly aware that another vehicle is close by with a boom-box unit playing music so loud that our car may seem to shake. The driver is usually alone. And a window or windows are always open. Why would this be? Perhaps the driver feels this is cool and wants to get our attention. It's possible but doubtful that the driver just wants to share this music with us all. However, a more likely reason is that, without an open window, the sound level in that vehicle would reach, and likely exceed the driver's thresholds of discomfort or pain. When you place the ear buds in your ears you have a trapped air space between the buds and your eardrum. Unlike the person in the car playing music at high gain levels, the open window allows some of the sound to escape. that escape does not exist with the buds in place. So, when listening to your MP3, initially set the loudness level at a point that sounds comfortable to you. In time you are likely going to want to turn the loudness control to a higher level. What's going on here? Since the space between the buds and your eardrums is trapped, and we all like to listen to music at some higher level, if the level is high enough (and it probably is), your brain will be activating the middle ear muscles to protect the inner ear by msking the eardrums stiff, reflecting sound away. But soon the ear muscles fatigue. The inner ear hair cells become over stimulated and no longer function as before. Sounds will appear weaker and distorted. You'll want the sound louder and you'll probably turn the gain higher again. Here's where the situation gets tricky. As reported earlier, in time, over stimulation can damage and/or destroy the hair cells. Damaged hair cells are not reversible. So, what is one to do? A principal well understood in the field of hearing loss from industrial noise exposure is that noise induced hearing loss is a function of sound intensity and exposure time. The federal Occupational Safety and Health Act (OSHA), has established a formula of exposure intensity and time of exposure with predictable temporary hearing threshold shifts. This formula dictates how long a person must be away from the sound in order for the heightened hearing threshold to return to normal. No one knows the sound level your ears will have been exposed to listening to your MP3 player. So, to save your hearing, you will have to determine your own On-Off formula. If you listen with your buds for a half hour, remove your buds for perhaps 2 to 3 minutes. If you find the loudness level is now too high when you replace your buds, you will know that you have been over stimulating your ears. Turn the sound level down to the comfortable level. If you discover that you have ringing in your ears when you remove the buds, you have been over stimulating. Experiment and determine your own personal formula. The Semicircular canals consist of three hollow semicircular tubes falling into three planes: one facing north to south, another east to west and the third, a flat or horizontal plane. The tubes contain the same fluid that is found in the hearing portion of the cochlea. The inner ear walls of the tubes contain tissue that is sensitive to gravity's pull. When we are in the vertical position, as when we are standing or looking straight ahead, the fluid exerts weight at the base of the three canals. Our brain interprets this information as we are standing upright. If we tilt our head to one side, the weight of the fluid will fall on different surfaces from our straight up position. Our brain indicates the position change. When we experience a ride at a local amusement park, where we are being tossed about by centrifugal force, the brain doesn't quite understand what is going on and tries to confirm gravity pressures with what the eye is reporting, resulting in a very "pleasurable ride". if you enjoy that kind of thing. Purchase a package of inexpensive foam earplugs from your local drug, sporting goods or hardware store. Prior to an automobile trip of 20 or so miles, insert an earplug into one ear canal; the one next to the car window. Turn the radio on to a comfortable level and have conversation with the other passengers present. At the end of the trip, get out of the car, remove the earplug and be surprised at the difference in hearing between your ears. Try the same, single earplug experiment at a cafeteria for lunch. Hearing in the ear with the plug is better than the ear exposed to this normal everyday experience. In a short time in quiet, hearing will become equal again. But, with continued experiences, in time, subtle hearing loss will likely remain. In fact, we are exposing ourselves to listening environments like this and in many other ways. Our ears are very complex and provide us with an incredible amount of information about what is happening in our environment. 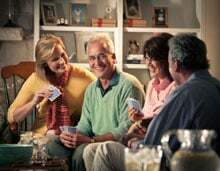 Why are my hearing aid batteries not lasting very long? Your new hearing aid battery has not lasted very long because you did not wait at least one minute before using it, after you removed the freshness tab. The hearing aid battery changed in June of 2011. That is when most manufacturers removed mercury from the hearing aid battery to comply with state laws banning the use of mercury. If you haven't already noticed on the packaging of your hearing aid batteries, all are now mercury-free. Today's zinc-air mercury-free hearing aid batteries need a longer time to fully activate, once the freshness seal is removed. Zinc air batteries use oxygen from the air as a source of power. The battery's ingredients begin to activate once the tab is removed and the air enters into the tiny pinholes. Zinc air batteries, previously with mercury, activated much faster and performed more consistently throughout their life. As a result, the new mercury-free hearing aid batteries take much longer to activate, and may not perform as well as they did when the batteries contained mercury. Always buy the freshest batteries you can find. Hearing aid batteries have a four year shelf life from the date of manufacturing. In other words, to know when the battery was made, subtract four years from the expiration date on the package. Store your batteries at room temperature, as heat shortens the life. It is not necessary to refrigerate them. Do not carry batteries loose in a pocket or purse, as metal objects (coins) may short them out. Instead use a "battery caddy" (a small plastic carrier containing 2 to 3 batteries). Ask your hearing aid specialist for one. You will find some of the freshest batteries at hearing aid offices.